Hackers are often portrayed as anarchists or criminals, but many hacker gatherings seek to be a force for good. Random Hacks of Kindness tries to leverage Internet data to address world problems. (CNN) -- When you hear the word hacker, you probably don't picture someone dedicated to solving the problems of global development. But this weekend, self-proclaimed hackers around the world will gather at "hackathon" events to tackle disaster-risk management and climate change. The occasion is the semiannual Random Hacks of Kindness global conference, which seeks to leverage Internet data to address world problems. The group solicits "problem definitions" from organizations in the field of disaster preparedness, relief and climate change and puts them before "tech-savvy do-gooders," according to Elizabeth Sabet from SecondMuse, RHoK's global operational lead. 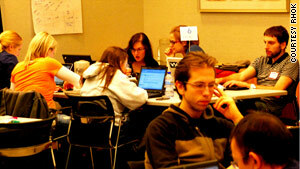 It's this synthesis between subject-matter experts and computer hackers that makes RHoK effective, its leaders said. "Technical solutions created only by technical people are often too cumbersome for the field," said Philadelphia organizer Mike Brennan. "Solutions created by field experts alone often lack the technical and scientific basis for an effective solution. RHoK is looking to address these weaknesses directly." Sabet is also quick to point out that "hacking" doesn't always mean what some people might think. Hackers at a Random Hacks of Kindness gathering in December 2010 in Chicago. "RHoK celebrates hacking in its most positive context -- using minimal resources and maximum brainpower to create outside-the-box solutions -- 'hacks' -- in response to interesting problems," she said. "The intent is to finish the weekend with some concrete prototypes and demo applications that can go on to be put to use by the experts and (nongovernmental organizations) who proposed the problems." If previous years are any indication, these hackers will walk away with real results. The 2009 RHoK event generated I'mOK, an SMS service used by people in Haiti and Chile to inform families of their status via mobile messaging after the earthquakes in those countries. The World Bank is piloting a program generated at the 2010 RHoK to visualize landslide risk. These are just two of many examples. RHoK serves as a global umbrella organization and provides resources, but volunteer groups on the ground in each city put together the individual events. Willow Brugh is one such volunteer, hard at work preparing the RHoK this weekend in Seattle. She said she's still enthused about last year's event in which she was part of a team that designed a tool enabling disaster victims to report their losses more easily and ask for help. By the end of the weekend, her team had functioning prototypes of an iPhone app, an Android app and a Web portal. Now local governments across the country are picking up their program. "That's a success, when the thing you've built continues to be used and worked on, and makes it out to the public," Brugh said. "It was awesome." In Melbourne, Australia, RHoK has been driven by issues close to home. "Many of our friends and families have been personally impacted by the bush fires and floods in Victoria, and we know people who experienced the tsunami and the Christchurch (New Zealand) earthquake," Melbourne organizer Jane Treadwell said. "No community is perfectly safe from these threats, and through RHoK we can all make a contribution to preventing, helping and alleviating stress and suffering." In Bangalore, India, Praveen Selvasekaran has been working with "a volunteer army of 10 members" to put together an event for an expected 200 hackers. The Bangalore event will follow the common RHoK format, he said, but each hackathon is far from identical. "What really makes every RHoK unique is the ability to solve local problems," he said. "Sometimes two different RHoK locations may take a completely different approach to the same problem." That diversity of outcomes is exactly what makes RHoK appealing to its sponsors, according to Nicholas Skytland of NASA's Open Government Initiative. "Innovation is always a numbers game: The more you do it, the better your chances are of being successful," he said. The process of innovation is itself much of the reward, Skytland said. "RHoK breaks down barriers that prevent innovation and challenge the way business has always been done, by taking advantage of many of the possibilities created by working in a networked digital world. A successful weekend for us is one in which hundreds, if not thousands, of developers from around the world gather to invent technology that didn't exist 24 hours ago." Gather they will, from Nairobi, Kenya, to Buenos Aires, Argentina, and everywhere in between. RHoK organizer Heather Leson has been putting together Toronto's second RHoK and is expecting 90 hackers to attend. "The most exciting thing is to watch brains collide," she said. "People come from all walks of life. We have emergency managers, accountants, health care professionals, journalists, open data and open source developers, UX/UI, trainers, and many more. It is a diverse group of people lending their time, energy and knowledge in inspiring ways."